Preheat oven to 225 degrees Fahrenheit. Line a baking sheet with parchment paper or nonstick foil, and spray with canola oil. Set aside. Place in preheated oven and bake 45 minutes. Rotate baking sheet, and bake an additional 30-50 minutes, until chips are browned and crisped to your liking. These are best eaten within a couple hours of removing from the oven, as they start to get chewy if left out. 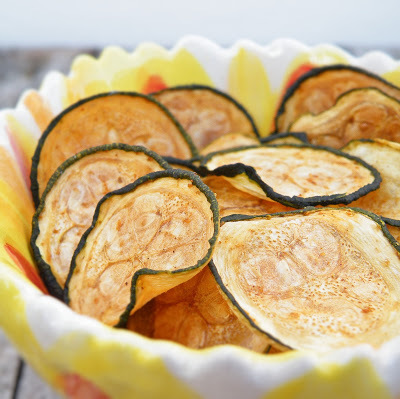 One zucchini makes one serving (1/4 C. – 1/3 C. of chips depending on the size of your squash).